The case is still open on Criminal Minds. Despite being on the bubble once again this year, the crime procedural series has been renewed for a 14th season. But, could this be the show’s last year? 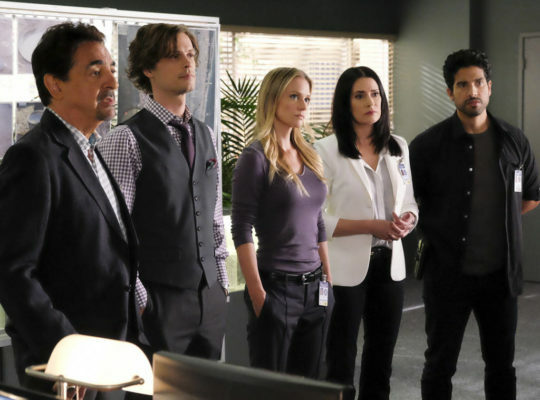 Airing on the CBS television network, Criminal Minds stars Joe Mantegna, Paget Brewster, Matthew Gray Gubler, A.J. Cook, Kirsten Vangsness, Adam Rodriguez, Daniel Henney, and Aisha Tyler. This season, Shemar Moore guest stars. The series follows the FBI’s elite Behavioral Analysis Unit (BAU) out of Quantico, Virginia. The BAU remains dedicated to understanding predators’ motive and triggers, in order to stop them before they strike again. Over the years, Criminal Minds has slipped quite a bit in the ratings but the numbers have dropped significantly this season. Season 13 averaged a 0.99 rating in the 18-49 demo and 5.73 million viewers. For comparison, season 12 of Criminal Minds averaged a 1.39 rating in the 18-49 demo and 7.466 million viewers. That’s a 29% drop in the demo and a 23% drop in viewers for the CBS series. There has been talk about this potentially being a final season of 13 episodes to give the long-running series a proper sendoff. We’ll likely know more next week, when CBS has their upfront presentation on Wednesday. For now, fans can rest easy knowing that the season-ending cliffhanger will be picked up in the show’s season 14 opener — episode 300 of the series. What do you think? Are you a fan of Criminal Minds? Are you glad that it’s been renewed for a 14th season? Should this be the end? I love criminal minds…only criminal show I watch! I don’t watch any other criminal shows like NCIS or whatever else. I want this show to continue until season 20! I love the characters and the quotes and miss Hotch and Derek also. I have rewatched all the episodes on Netflix several times! Please don’t end this show CBS! I am not in the ratings since I don’t watch them on TV when they come out but eventually watch the episodes online. Criminal Minds has and always will be the best criminal show to have ever been on TV. I love the part of it dealing with the “mind” part of the crime. Matthew Gray Gubler’ character is awesome and he plays the part so well. I would hate to see it end but also don’t want it to get to the point of running out of story lines. I will forever watch. I adore criminal minds and so very pleased that there is a 14th series and always hoping another series will always follow, Dereck Morgan guest stars on occasion but it would be great to see him make a come back also Aaron Hotchner could also make appearances or a come back but each time one leaves they are replaced with great characters, please keep this wonderful show going with many more seasons.